Are you a runner who loves to take your dog along but hates holding a leash? Do you prefer the ease of hands free technology but have no idea where to look with the endless options on the market today? Plan out your next run and leave the hard work to us. We’ve checked out the market and have narrowed the field to find the best hands free dog leash for running that will help you and your pooch’s workout hit new strides. With anything new you’re bound to have questions. We’ve broken down some FAQs for you to make the decision easier. What is a Hands Free Leash and How Does It Work? Running generally involves pumping one’s arms in a continuous motion with each stride, a tug that can be uncomfortable for a dog unless an owner alters their arm’s movement which can be restrictive. 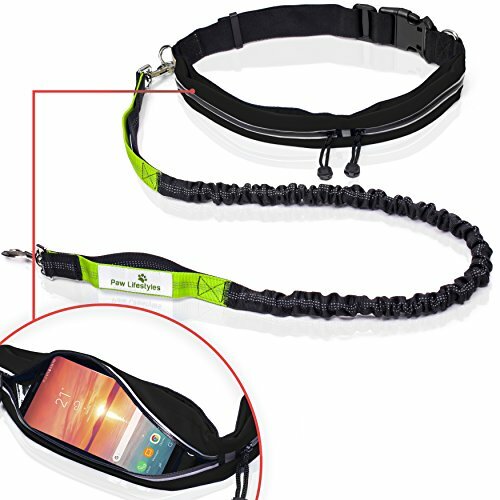 A hands free dog leash generally straps to the owner’s torso, allowing for a hands free running experience. Using a hands free leash can be safer for the owner as well, as a sudden tug on the arm is more likely to lead to a dislocated shoulder or fall as seen in this article by Dr. Sophia Yin. Are Hands Free Dog Leashes Safe? Yes, using a hands free leash properly is actually safer for you and your dog. You’re less likely to suffer a fall with the use of a hands free leash, as the leash is typically anchored to your torso. This is your center of gravity and is less likely to be shifted than a sudden yank on your arm. Also, hand free leashes clip to your body, leaving no worry that you’ll accidentally drop a leash or suffer leash burn on your hand from a sudden pull. If you’re new to running, make sure you slowly work yourself and your dog into the routine. Not all breeds or people are built for marathon running after all. You want a leash that’s made of quality materials and made specifically for running. Most are made of a quality nylon which is what you want in a leash, not flimsy fabric or plastic. The best also feature larger carabiner clips, built for securing a running dog up to 100 lbs or more. The ideal length for you will vary depending on you and your dog’s running style. Some pairs will enjoy longer lengths up to 80 inches if they often run in remote areas for long distances. Others will require a shorter length if they run in populated areas or if their dog is prone to falling behind, leading to slack that owners may trip over. You want a leash that is going to last. The best leashes are made of all-weather nylon that can withstand water, cold, and heat. The best leashes are adjustable in nature, allowing owners to customize the fit and length based on their desired run. Comfort is key with running so make sure the waistband is comfortable for you. Select one that fits you comfortably and isn’t too snug. Too snug of a waistband can cause skin irritation and discomfort. For early morning or night runners, reflective material is a must to keep you and your pup safe and visible in dim light. Many leashes have a reflective stripe or pattern on them to keep both you and your pup safe. A quality leash will offer bungee technology, absorbing the force and pull of your dog rather than putting that strain on your body throughout the run. This is especially important if you have a large, powerful breed such as a Malamute. Be warned however, as some dogs exploit the bungee and tug even harder! 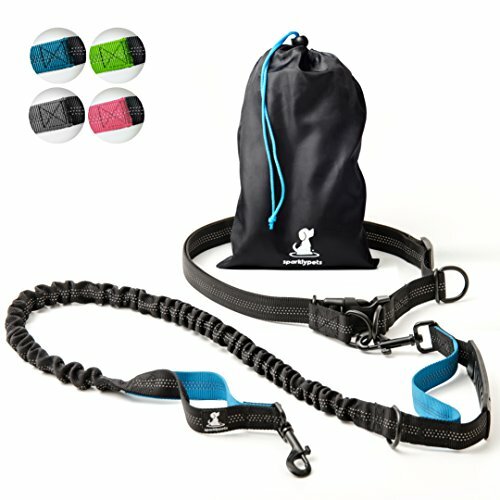 How to Train Your Dog with Hands Free Leash? Training your dog to run with a hands free leash is just like introducing any other new tool or object. Make the experience fun and allow your dog to explore the new leash with their nose through sniffing. Practice clipping the leash to your dog and walking them the old-fashioned way in a safe, familiar area. This will allow them to get used to any new sights, sounds, and sensations of the leash such as bungee technology. In time, wear the leash as intended and start small with light jogs until you slowly reach your desired speed. This process will slowly introduce the leash and make for a desirable experience for both of you. Running with your dog with the newfound freedom of a hands free leash is wonderful. You and your dog will seamlessly fall into step with one another in no time with proper preparation. As with any run, you want to make sure you pack plenty of water for you and your furry friend as well as start slow. Warm up both you and your dog’s muscles to avoid strain and injury. You also want to check your dog’s nails and feet to make sure they are in optimal condition. Do not run a dog with an obvious injury or long nails. Long nails can break or crack, causing pain to your dog and potentially needing a vet visit. For additional tips and tricks about beginning a running routine with your pup, please see this helpful video above. The SHINE HAI Retractable Hands Free Dog Leash with Dual Bungees for Dogs up to 150 lbs was a delight from start to finish. It offers up plenty of additional features that make it an all-around hands free leash rock star including bungee construction absorbed shock like a champ – I have two rambunctious pit bulls that barely rocked me thanks to the bungee. Despite its strong showing, it did have some slight drawbacks like may be a bit too heavy duty for little guys. My Chihuahua didn’t seem to mind it, but some smaller dogs may find the leash a little too bulky for their liking. The SparklyPets Hands-Free Dog Leash for Medium and Large Dogs is another solid option for those with larger dogs. It stood up well to my crew aside from the little guys. It wears well, works well, and makes for a great leash thanks to a number of features like dog’s leash extends up to 68 inches for free range of movement but not too much slack. While this was a solid choice for a number of reasons, there were a few weak spots, namely that some may find the waistband a bit too large which can lead to discomfort if used. Never use a waistband that is too loose. The constant slide against your body can cause irritation. 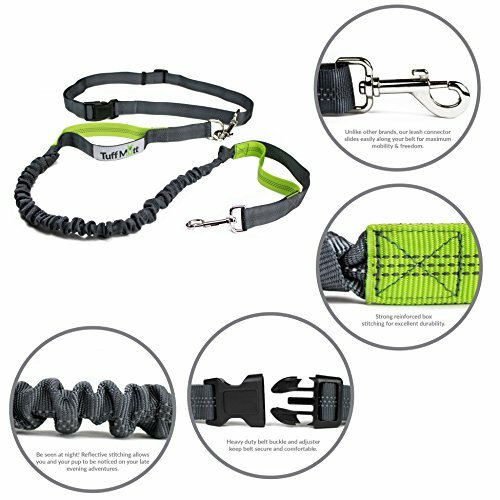 Another awesome choice is the Paw Lifestyles Retractable Hands Free Dog Leash. It passed a lot of our tests with flying colors and performed well in the field. It has a lot to love about it, including belt adjusts up to 48 inches and is thicker, which may be more comfortable for some users. One color option available. Variety is the spice of life, no? While this leash wowed me with a lot of its offerings, it still had a few areas that may not work for some owners like can be bulky for smaller dogs, a common problem with hands free leashes because of the desire to build a stronger, more durable leash for powerful breeds. The Tuff Mutt Hands Free Dog Leash for Running is another great choice for owners looking to branch into hands free running. Like the others, it performed well in use. It has plenty to love about it including clearly built tough with a strong, heavy construction for large breed running partners. While I enjoyed this leash for a number of reasons, I also found some glaring drawbacks that would be deal breakers for some users including the 48 inch leash length is ideal for city runners, it can feel restrictive to some users unless your dog tugs it to the maximum 60 inches which isn’t comfortable at all for wearers. 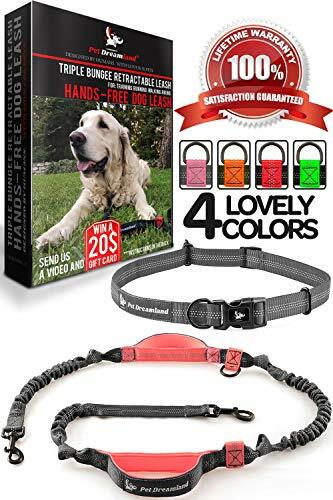 The Pet Dreamland Hands Free Leash is a great option for those with large breed running partners. It was a hit with my eldest pit bull who is all muscle and only one speed – fast. There’s a lot to love about it like it is strong enough for dogs up to 150 lbs. This covers the bulk of large breed dogs. It also offers 59 inches of leash and can be expanded to 76 inches if you desire by untying knots. While this one had a whole lot to love about it, it did have some areas of concern including thin waistband can be uncomfortable, especially if your dog makes a sudden tug and it digs into your skin at all. When we poured over our options, our clear winner was the SHINE HAI Retractable Hands Free Dog Leash with Dual Bungees for Dogs up to 150 lbs. It crossed off the most boxes when it came to durability, comfort, and versatility. The longer length allowed for a more enjoyable run and the belt was the most comfortable for users. It was strong enough for a rambunctious pit bull but not too clunky for a Pekingese. It was also a clear winner when it came to its reflective properties for low-light usage. 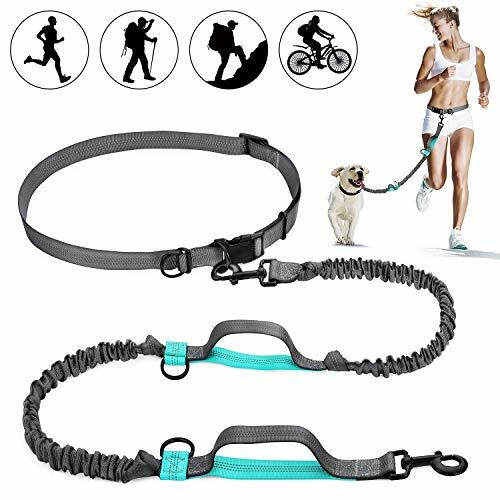 As with any decision, when selecting the best hands free dog leash for running, you want to consider your routine and your dog. If you’re a nighttime runner, reflective materials should be paramount in your decision. Likewise, if you have a larger breed, you’ll want a leash that can handle the weight of your pup with ease. Enjoy your new adventures with hands free running!